Errr, marrow is off today. 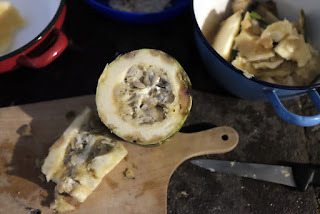 As the last marrow and pumpkin begins to resemble a fruitcake look with all it's yellow, red and black mouldy spots, it is time to clear the cellar's content. Nearly 30 of these have carried us through the darker months and now a slightly tiring reluctance to take the last few for processing. Chopping the tops and bottoms, the mush begins to ooze. But after slicing the hard skin (and some of my own), there are edible glimpses of the former vegetable. Compost loves this stuff, the bad stuff that is. Already rotting, your fingers poke through it like butter. Some of the better looking gung goes to the hens to finish off, the rest for the heap to gobble. The seeds have their own destiny. Separated as a collective, and buried into any useful space in the garden. The fittest will hopefully survive and reproduce and surprise us where we planted them. And then what's left from, is a meal or two if you are lucky. A few fat chunks, chopped and roasted with olive oil and herbs. It certainly isn't pretty to do this with leftovers of last Autumn's harvest, but at this time of year between eating and growing, a few cents are saved.